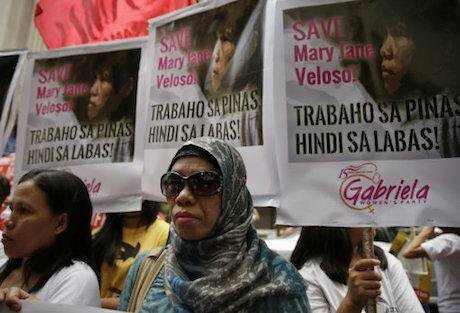 Protesters appeal to Indonesia to spare Mary Jane Veloso, Philippines 2015. B. Marquez/AP/PA Images. All rights reserved.In 2007, Supatta Ruenrurng travelled to Laos from her native Thailand. There she purchased one and a half methamphetamine tablets weighing 0.17g and brought them back to Thailand for personal use. She was arrested at the border and charged with importing and possessing a category one drug under the 1979 Narcotics Act. The court initially dismissed the importation charge on the basis that the minor quantity of drugs involved was for personal use and would not cause any harms to society. Supatta was sentenced to six months in prison (suspended for two years) and was issued a fine for possession. This sentence took into account the fact that she had confessed to possession for personal use, that it was her first offence and she was the mother of a child for whom she was the primary caregiver. However the prosecution contested this decision, and on appeal the court found her guilty of drug importation, handing her a sentence of 25 years behind bars, reduced from life imprisonment due to Supatta’s confession, with immediate effect. The Supreme Court affirmed this decision. A gender and human rights perspective is overlooked when it comes to drug laws and public policies in south-east Asia. Supatta’s case demonstrates the injustice of disproportionate sentencing practices and how women and their dependents are particularly affected by such harsh measures. With no consideration of mitigating factors by the higher courts, she was sentenced for importation instead of consumption despite the small amount of methamphetamine in her possession. In Thailand, where reducing prison overcrowding has become a government priority, the royal family issues an amnesty approximately once a year in which some prisoners are released, but Supatta has not been among those to benefit from this measure. Pardons and amnesties can impact several groups among the prison population, especially in cases like Supatta’s where lengthy sentences are unjustly handed out for low level drug crimes. Yet such short-term measures, if not accompanied or followed by sweeping and far-reaching reforms in drug laws, will not achieve a sustained reduction in the number of people in prison. Sentences of 25 years for women and men involved in low level drug related offences are regrettably common in a region that continues to uphold the impossible goal of achieving a ‘drug-free society’. Despite the proven failure of such an objective and the actions taken in vain to achieve it, this ‘drug-free’ narrative continues to taunt the people of south-east Asia. It is a narrative that criminalises drug users, low-level drug offenders, and rural crop cultivators despite a steady rise in health-related harms, incarceration rates, an exacerbation of poverty and marginalisation, and countless human rights violations as a direct result of these policies. While funds are channelled to the expansion of eradication operations, and to the ‘stamping out’ of drugs by heavy handed law enforcement strategies, the objective of removing illicit drugs from the region has not been (and will never be) achieved. Nonetheless most ASEAN countries made statements during the 2016 UNGASS, reaffirming their objective of a drug-free region, and defending disproportionate measures such as the death penalty for dealing with drug related crimes. Despite the efforts of ASEAN governments to suppress the use and supply of drugs through stepped-up law enforcement capacity and other repressive measures, south-east Asia has seen increases in illicit drug supply, trafficking, and use. Instead of conducting an objective and meaningful review of their approach, they have responded by conducting large-scale arrests for drug offences, particularly in relation to methamphetamine in recent years. Although there is a lack of recent and reliable data about prisons in the region, preliminary studies have shown that this approach has led to overcrowding and a significant proportion of the prison population in the region being deprived of their liberty for low-level drug offences. In its Global Prison Trends 2015 report, Penal Reform International found that while women comprise an average of 6.5% of the world’s prisoners (over 660,000 women as of 2013), they constitute the fastest growing prison demographic with particularly high rates of imprisonment for drug related offences. The proportion of women incarcerated for drug offences is significantly higher than that of men, with the highest levels of women’s incarceration to be found in south-east and east Asia. In Thailand, 287,335 people were in prison as of 2013, of which 50% were charged, convicted or detained for drug offences and about 14% were women – a much higher percentage than the global average. The International Centre for Prison Studies reports that Thailand’s prison overcrowding is around 134%. As of 2015, over 47,000 women were behind bars in the country. The data on the specific conditions and caregiving status is scarce and unreliable. However in 2014 it was reported that there were more than 260 pregnant women in Thai prisons and over 250 babies living behind bars with their mothers, though it is believed that this figure is much higher. The Thailand Institute of Justice revealed in a report on “Women Prisoners and the Implementation of the Bangkok Rules” that over 80% of women in prison in Thailand have been convicted of drug offences, compared to 61% among male prisoners, according to official figures as of 2012. While national drug laws accommodate the notion that people who use drugs are ‘patients not criminals’, in reality people who use drugs are frequently deprived of their liberty for simple consumption, and there is little understanding or consideration of evidence-based treatment and harm reduction, let alone gender-specific programmes where the needs of women who use drugs are adequately incorporated. According to the International Drug Policy Consortium (IDPC), people who use drugs are highly stigmatised, harassed by law enforcement officials, unlawfully tested and detained on suspicion of drug use, and excluded from accessing health, social and legal services. During the recent United Nations General Assembly Special Session on drugs (UNGASS), there was mounting pressure from the international community for countries that retain capital punishment for drug offences to issue a moratorium on the death penalty. Despite this, and the evidence that women are framed by traffickers to transport drugs across international borders without knowledge of the quantities they are transporting or the risks and consequences involved in doing so, women are still kept on death row for drug smuggling offences. This is a common and increasing phenomenon in countries such as Thailand, China, Malaysia, Indonesia and various Middle Eastern countries – most of which used the UNGASS to defend the use of the death penalty as a deterrent against drug trafficking and organised crime. The Philippines stood out during the meeting as the only Asian country to directly condemn the use of the death penalty for drug offences. The death penalty is no longer used in the country for these crimes, and national authorities have been concerned about the increasing numbers of people engaged in drug smuggling, mostly women, who have been arrested, on death row or executed in foreign countries over the past decade. One example of this is Mary Jane Veloso, a young Filipino woman and mother of two who was given temporary reprieve minutes before she was scheduled to be executed by firing squad in Indonesia last year. She was spared because of evidence brought forward by the Philippines government that she had a been a victim of human trafficking, exploited and tricked into carrying drugs to Indonesia. This caused widespread sympathy and a public outcry from the Indonesian public, who took to Twitter to demand her release. In the lead up to the 2016 UNGASS, a number of campaigns have been launched from families of incarcerated people and those affected by the drugs war. Influential publications on drug policy reform from a gender perspective and international collaboration between civil society and concerned government officials have all contributed to the development of new approaches such as alternatives to incarceration, the decriminalisation of drug use, and the adoption of laws and policies that offer more proportionate approaches. However, the UNGASS outcome document did not reflect the voices of affected communities and largely excluded the opinions of an ever united global public in its support for ending the ‘war on drugs’, which is essentially a war on people. Strong civil society engagement in the UNGASS process helped to lessen the prohibitionist language as much as possible, but the outcome document as a whole shows that there is still much work to be done to move the UN and countries that purvey a more repressive message towards reform. The gender component of the outcome document, though weak in its language, did emphasise the importance of “mainstreaming a gender perspective into and ensuring the involvement of women in all stages of the development, implementation, monitoring and evaluation of drug policies and programmes.” Work that is being carried out to raise this issue in Latin America and the Caribbean is a good example of how women’s voices can be incorporated into the drug policy debate, and it would be encouraging to see similar joint projects in Asia through collaborations between governments, multi-lateral agencies, civil society, incarcerated and formerly-incarcerated women and other affected communities. While it is apparent that women in Asia are often used as human couriers, and considered expendable by trafficking networks that exploit their conditions of vulnerability, an understanding of the impact of the drugs war on their lives and livelihoods has remained largely absent from the research and activities of regional and international organisations. Their stories have similarly been unheard and their faces invisible to the public as mainstream media prefers to report on drug seizures and security related issues. The reality is that these women – contrary to the narrative of governments in the region – rarely pose a threat to society. They are often poor women who are responsible for young dependents, and with low levels of education. Their lives are characterised by social exclusion, and the low levels at which they operate within trafficking networks – often as small scale distributors or consumers – do not comply with the narrative of fear through which governments justify their ‘iron fist’ approach. Reporting on the lives and struggles of these women would reveal this heavy-handed strategy as disproportionate and misguided. During the Commission on Narcotic Drugs (CND) earlier this year, a resolution was passed on “Mainstreaming a Gender Perspective in Drug Policies and Programmes”. It is hoped that governments in south-east Asia work with civil society to design and implement gender specific policies, using this resolution and related materials as a guide, bearing in mind the risks that the current drug control system pose to women’s well-being, and that of their families and communities. A good place to start would be giving incarcerated women a voice and inviting them to share their stories from prisons in Asia so that the public can begin to see the human face of repressive policies and the lives destroyed in the pursuit of an impossible ‘drug-free world’.